Dedicated to John Velie (1936-2015), Albany (N.Y.) High School English teacher and drama coach who directed me in two productions of Romeo and Juliet and instilled the love of Shakespeare and theater into several generations of young people, including myself. The Shakespearean monologue has long been a focal point in English literature for the exploration of classic existential themes, such as mortality in Hamlet’s meditation on the passing of the court jester Yorick, or the fine line between dreams and reality as explored by Mercutio in his Queen Mab soliloquy in Romeo and Juliet, Act I, Scene IV. 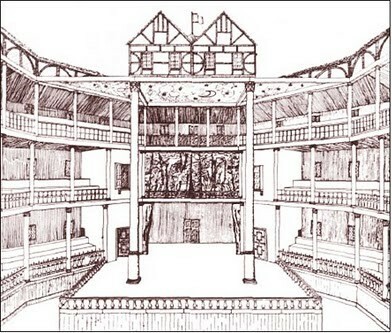 The setting of Act I, Scene IV is not only on the streets of Verona, Italy at night, but it is also in the Globe Theater in London, England. It is important to establish a link between both these settings because Shakespeare capitalizes upon the existence of both to draw the audience into the action of the play. The intimacy between Romeo and Juliet is mirrored in the intimacy between the performers and the audience. Fig. 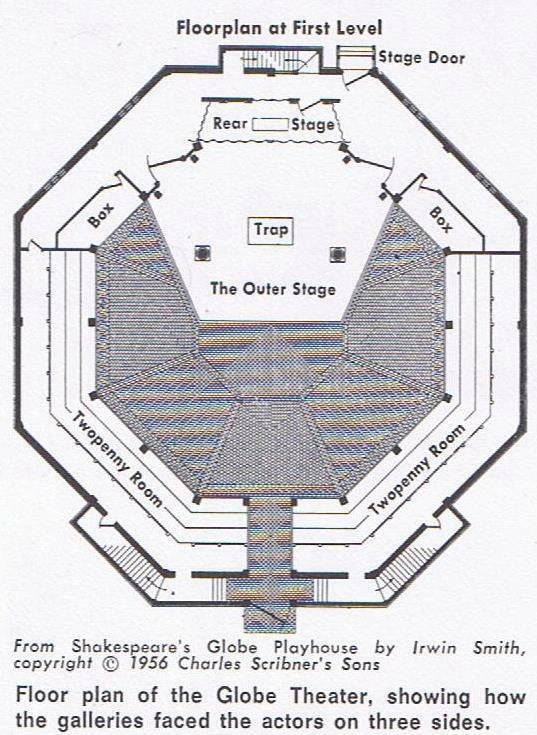 2: Diagram of the Globe Theater stage. Shakespeare is not only aware of the structure of the Globe Theater, but in fact writes with the architecture of the theater in mind. The stage juts out into the center of the theater so the actors are surrounded on three sides by up to 3,000 spectators. This type of theater construction greatly increased the intimacy between the actor and the audience for it not only put the performers directly into the middle of the audience, but also drew the audience into the action of the play (“The Old”). The audience is no longer passive, sitting behind an invisible “fourth wall,” but rather they are now directly involved in the action. In Act I, Scene IV, the audience at the Globe Theater is part of the Romeo’s and Mercutio’s band of rowdy party goers. Here, Shakespeare is deliberately leading the audience into the action of play, blurring the lines between illusion and realty, a major theme of the Queen Mab monologue. Blurring the line between reality and illusion further, this type of street scene was a very common type of gathering for Shakespeare’s audience. They are not in a city in some foreign land; in fact, the action in the play could be right there in London. At this point, the audience ceases to be a random group of spectators and becomes part of the scene, transformed into maskers and torchbearers themselves. At this point in the play, a comedic element, albeit with some dramatic undercurrents, has been established. For this reason, the audience, naturally drawn to Mercutio’s humor and Benvolio’s good-nature, finds Romeo’s love-sickness a bore. They are spending what few pence they have for an evening’s entertainment and they want action, adventure, and romance — not Romeo’s adolescent whining. The result is that when Mercutio challenges Romeo and launches into his Queen Mab soliloquy he speaks not only for himself and Romeo’s companions, but for the audience as well. Romeo is alternatively morose or rash, and as a result, Shakespeare creates a subtle antagonism between the audience and Romeo that is exploited here, as well as in other scenes. The effect is that at the end of the play when Romeo and Juliet take their own lives we feel complicit with the action that led to this conclusion. Very clever Mr. Shakespeare, very clever indeed . . .
Romeo: WelI, what was yours? Mercutio: 0, then I see Queen Mab hath been with you. In line 56, Romeo suggests that while dreamers dream, they are able to forecast future events, or at the very least, that dreams have an element of truth that reality lacks. Mercutio responds, refuting the validity of dreams in the Queen Mab soliloquy. The Queen Mab speech ranks as one of Shakespeare’s great soliloquies. Via a conscious manipulation of the audience, the theater, and the play itself, what takes place on the stage, if well-acted and directed, becomes a sum greater than its parts. To read the soliloquy on paper, one marvels at Shakespeare’s mastery of language, meter, and myth. In the Globe Theater, with the main stage thrust right into the audience, one becomes part of the action. It is a common human experience to be in love to the point it overwhelms our ability to enjoy life, so when Mercutio launches into his soliloquy he is not only speaking to Romeo, but to ourselves as well. 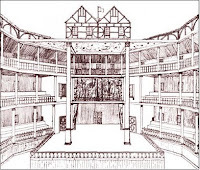 An affect amplified by having the stage at the Globe Theater bring the action right out into the audience, and, as a consequence, draw the audience right into the action. Beginning with line 55, Mercutio uses the various mythological imagery related to Queen Mab, a Celtic fairy, to draw the allusion for Romeo that love is as intangible as the dreams spun by a fairy. Faeries are part of the Green World, the realm in which nature-based Celtic spirit-beings, such as fairies and wood nymphs, exist. It is there, with such insubstantial beings, that love exists, argues Mercutio in this soliloquy. Like the ephemeral world of Queen Mab — which exists only in our dreams — the reality of the play, into which both the performer and observer are drawn, is an illusion made real by the willing suspension of disbelief by those involved, like love, suggests Mercutio. Romeo interrupts Mercutio at line 100 (“Peace, peace, Mercutio, peace! Thou talkst of nothing”), abruptly breaking the imagery and power of the soliloquy. In a way, this only serves to prove Mercutio’s point that love is an illusion, and as easily broken as waking from a dream (MacArthur 40). While from one perspective Mercutio’s point is proven, on another level it could be argued that just the opposite occurs. Once the spell is broken, the audience is able to see that dreams and illusions are indeed powerful tools, for they recognize that they themselves were drawn into the world created by Shakespeare. For a moment, they are no longer watching a play, but are part of the play — bystanders on a street in Verona. If we can be so drawn into this illusion, the play, then perhaps there is something to this “love” thing after all, despite what Mercutio says. The audience, based on their experience with the play, accepts the validity of dreams as a source of premonition (Romeo: “In bed asleep, while they do dream things true,” Act I, Scene IV, l. 56). Shakespeare, by having Mercutio create a wild fantasy to argue against the validity of dreams, and drawing the audience into the play’s illusion, reinforces the truth of dreams. This is through an experiential path that could only have been taken by a playwright conscious of the structure of the theater and the importance of having the audience interact with the play to reinforce concepts integral to the scene, reaffirming the participation of fate in the lives of Romeo and Juliet and the reality of the love they share. The comedy in Act I, Scene IV largely centers around Mercutio’s and Benvolio’s attempt to break Romeo out of his downcast mood concerning both his doting on Rosaline and the dark foreboding of his dream. Most of the dialogue takes place between Romeo and Mercutio, who serves as a foil to Romeo, and mocks Romeo’s Petrarchan love for Rosaline. Mercutio insults Romeo’s Petrarchan love, and compares his efforts to cheer him up to an English winter game called “Dun in the Mire” in which players try to draw a log from a pool of mud (Partridge 865). Not much to do back then apparently. Mercutio belittles Romeo’s lovelorn infatuation, much in the way an older brother may tease a younger sibling to warn him away from an eventual heartbreak. Mercutio’s words betray him though, for his taunts are sprung from experience and therefore one suspects there must be a Rosaline in his past as well. 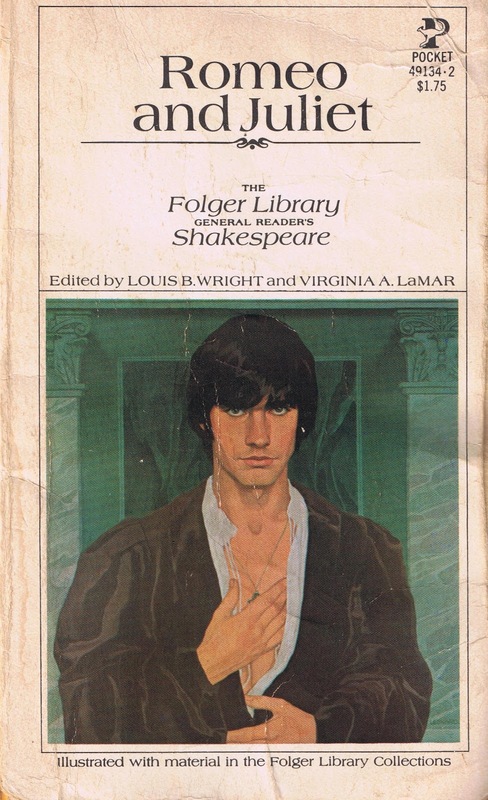 FranklIn Dickey suggests in his book, Not Wisely But Too Well: Shakespeare's Love Tragedies‎, that Romeo and Juliet is a tragedy built on a comedy (66). The comedy serves as a tool by which a more believable stream of events is created. Shakespeare realizes that humor pervades our everyday lives, sometimes, even in our darkest hours and by mixing elements of comedy and drama to present to the audience a more “realistic” scene, he further obscures the line between reality and illusion. Romeo and Juliet is a comedy for two acts — very close to half the acting time on stage. By establishing a strong comedic backbone to the play, the audience is lured into the eventual tragedy. Indeed, “love” was traditionally presented in an amusing manner on the Elizabethan stage and Shakespeare, at least in the first two acts, maintains that literary facade (Dickey 66). Certainly, the theater-goer in Shakespeare’s day would have expected any treatment of love on stage to conform to the norm. Not to address those expectations would have resulted in the play being less “believable” to the audience of that time. Shakespeare is able to draw the audience into the action of the play because he uses their expectations, rather than dismissing them. stand to in a month. Understanding the character of Mercutio is important to understanding Act I, Scene IV. His very name, taken from the Roman god Mercury, describes the alacrity of his wit and his role as a messenger — warning Romeo and audience alike of the dangers of impetuous love and unchecked passion, though that message comes at the cost of Mercutio’s own life. Mercutio is both cynical and satirical. He claims to disdain both poetic form and fashion (Act II, Scene IV, ll. 29-36, 37-46), yet his character is the very essence of poetry. The Queen Mab soliloquy is a passionate fantasy woven into one of the great monologues of literature. Mercutio embodies the spirit of comedy and when he dies in Act III the laughter vanishes from the play. Mercutio is, in many respects, a foreign element in the play. He is neither Capulet nor Montague. He is not as young as Romeo or Juliet, nor as old as their parents. He is a separate entity that should remain unaffected by the action of the play, but instead becomes its first victim. In Act I , Scene IV, we see Benvolio’s concern motivated by his deep love for Romeo. When Romeo and Benvolio exchange words in disagreement it is because of their respective love for one another; however, when Mercutio exchanges words with Romeo it is more of a philosophical disagreement, though not necessarily lacking in affection. In Act I, Scene IV, as well as Act II, Scene IV, we see Mercutio react almost violently to the idea that Romeo is enraptured by some Petrarchan ideal of love. One wonders if it is the philosophical difference that angers Mercutio more specifically than Romeo’s love-sickness over Rosaline. Harley Granville-Barker asserts in Prefaces to Shakespeare, Volume II, that Mercutio is a man of contradictions, pretending not to hold to any philosophy, though his arguments with Romeo are often philosophical in nature (337-338). The Queen Mab soliloquy creates a dichotomy by reinforcing the power of dreams through the literary power of the verse, while ostensibly being Mercutio’s attempt to discredit the dreamer. In the end, the lasting impression Mercutio leaves is that of the jester who, perhaps more than Romeo, was "fortune’s fool" (Romeo: “O, I am fortune's fool!” Act III, Scene I, l. 137). Unlike the predestined role Romeo and Juliet play, Mercutio was a wild card, a die cast into the events of the tragedy and fallen victim as much as to his own impetuous nature as to Tybalt’s sword or Romeo’s well-meaning, but eventually misguided interference. 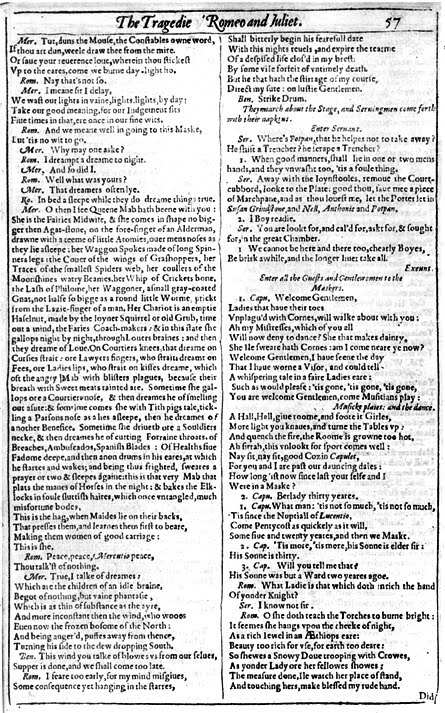 It has been argued that the Queen Mab soliloquy was not included in the original draft of the play and that it was added at a later date only to enlarge Mercutio’s role (Thomas 73). If true, this suggests that the monologue was added to provide some depth to the part only after the play had already been completed and, perhaps, performed. Fig. 4: Queen Mab Soliloquy-1623 Folio. This position is not without some textual support. Scene’s III and V in Act I both take place in the Capulet’s house, so one could skip Scene IV and there would still be a seamless transition in the action of the play. 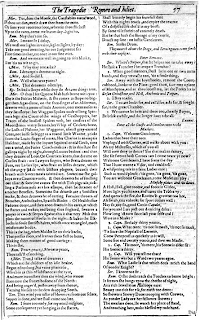 Nevertheless, the questions of love, dreams, illusion, reality, and fate, are best addressed at this very point in the play, right before Romeo and Juliet meet. Marjorie Garber in Dream in Shakespeare writes, “The Queen Mab speech itself is the play’s single most complex and important statement on dream" (65). Without the Queen Mab speech, this scene goes nowhere and serves little function in itself, except to show a mob of drunken young men on their way to crash a party. A philosophical discourse between Romeo and Mercutio on the nature of dreams versus reality would have been a real “show-stopper” in the sense that such an extended discussion would have stolen much of the energy and momentum the play has been building up to this point. The soliloquy not only sums up the intricate relationship between the characters, dreams, and fate, but does so in the one of the most dramatically challenging and poetically beautiful passages ever written in the English language. If Shakespeare did not include the Queen Mab passage in his original version of Romeo and Juliet, he must have added it later because he realized that a vital piece of the play was missing. Mercutio now breaks away from the insults he was throwing at Romeo and begins to ridicule our young lover by making light of the very thing he wishes to discuss, dreams. Mercutio refers to Queen Mab as "the fairies’ midwife," meaning that what she assists in bringing to life dreams. Mercutio's choice of words draws the audience into his dream-like world and he, for all practical purposes, takes on the role of Queen Mab to the audience. First, he plants the dreams into the audiences’ mind, then, like a midwife, he brings those dreams to life. Mercutio seeks to minimize the prophetic power of dreams by showing they are limited by the nature of the dreamers themselves. This is also Mercutio’s way of warning his good friend Romeo that our fates our based on our natures. As Mercutio’s impetuous tendencies will be his undoing, Romeo’s brooding, morose nature will be his own downfall. The soliloquy continues until Romeo, unable to bear anymore of Mercutio’s increasingly mad ravings, interrupts him, and breaks the spell abruptly, waking Mercutio from his dream. By calling the Queen Mab soliloquy “nothing” Romeo has been manipulated by Mercutio to a place he wanted Romeo all along. Mercutio began the scene by belittling Romeo’s dreams, treating them as if they were "nothing.” Now, Mercutio shows Romeo that his dreams indeed amount to nothing by reflecting them back to the forlorn young lover in a dramatic, if exaggerated, manner in the soliloquy. Like the ephemeral world of Queen Mab — which exists only in our dreams — the reality of the play, into which both the performer and observer are drawn, is an illusion made real by the willing suspension of disbelief by those involved, like love, suggests, Mercutio. Here, Mercutio feels he has made his masterstroke. In an effort to show Romeo the futility of putting too much stock into the validity of dreams or dreamers, he inadvertently proves the reverse. The actor, using the layout of the theatre as a lure, has drawn the audience into the action of the play — the illusion. In doing so, Mercutio fails to allay Romeo’s sense of foreboding, which came to him in his dream. Direct my sail! On lusty gentlemen! Thus, onward Romeo goes to meet the fate that came to him in a dream. London: Yale University Press, 1974. Print. Granville-Barker, Harley. Prefaces to Shakespeare, Volume II. Princeton, New Jersey: Princeton University Press, 1951. Print. Quarterly 10 (1959): 35-44. Print. Louis B. Wright. New York: Pocket Books, 1959. Print. Juliet.” Shakespeare Survey 25 (1972): 72-80. Print.